Price Promise The price you see here is the price you'll get. As long as the device arrives as described we will pay the full quoted value for your device. Selling your device: Don't have the charger or box? That's fine, we'll still accept it and you'll still get the same price. General cosmetic wear and tear is acceptable. Your device should be fully functional as intended by the manufacturer. Must have a working battery. See terms and conditions for full criteria. How much is my iPad Pro 9.7 Wi-Fi + Data worth? 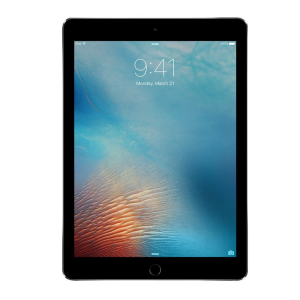 Selling your iPad Pro 9.7 Wi-Fi + Data with us can earn you a great bit of cash. The price quoted depends on the network for some devices, so to get an instant quote to sell your iPad Pro 9.7 Wi-Fi + Data, just select from the few options above and you can see the price we will offer you instantly. How Do I Sell My iPad Pro 9.7 Wi-Fi + Data? It's really simple to sell your iPad Pro 9.7 Wi-Fi + Data to us. All you have to do is select the relevant options for your device above to get an instant quote and then click "Sell Now". Fill in your details at the checkout page and then just click "Confirm Order". We'll then send you a postage pack if you requested one for you to send your device to us, or you can choose to print a freepost label yourself from us and use your own packaging to speed up the process. Once your device arrives with us we test it and once it is all verified, payment is issued to your chosen payment destination. We keep you up to date of every stage of your trade in with regular email updates of each stage of the process. It really is as easy as that to sell iPad Pro 9.7 Wi-Fi & Data! Why Should I Sell My iPad Pro 9.7 Wi-Fi + Data to GadgetReclaim.com? Whilst there are a lot of companies who will buy your iPad Pro 9.7 Wi-Fi + Data, we at GadgetReclaim are one of the best. We pride ourselves on our honest and quick service and fast same day payments. We offer some of the best prices for you to sell your iPad Pro 9.7 Wi-Fi + Data. You only need to take a quick look at our independent customer reviews over at TrustPilot and you will see for yourself just how good we are! So, if you are thinking, Where can I Sell my iPad Pro 9.7 Wi-Fi + Data?, then sell it with us the simple and effortless way and get free postage, fast same day payments and all of this in a super quick time frame, as well as getting some serious cash for your unwanted iPad Pro 9.7 Wi-Fi + Data! If you are looking to sell mobile phones, then look no further than GadgetReclaim. We have many years of experience and a wealth of happy customers that have used us to sell mobile phones, iPads and more. Find your device today and register your sale and we will hold that price for you for 14 days. Check out our reviews over at Trustpilot to see for yourself.